Tried a search on this topic but most answers pertained to boxters and 944s, where there was much discussion, but very little pertaining to the 996. I have a 2000 porsche 996 cabriolet in San Francisco CA. I have noticed that sometimes during especially hard rains, water will build up in the right hand side rear passenger footwell, beneath the carpet. I have checked the roof pretty thoroughly and everything seems quite dry up there. Where could this water be coming from? The walls seem to be dry as well. I have found some discussion in other forums suggesting that 944s have a problem with drains clogging up underneath the battery box, but do not understand how this could leak into the rear right passenger footwell without soaking underneath the carpet of the front passenger footwell ;-) Is there some sort ventilation system that stretches to the back seat area? The common leak in a 944 that you mentioned doesn't actually leak into the rear of the car. The drains under the rain guard at the base of the windshield get clogged than the water begins to rise. Eventually the water reaches the fresh air vents and pours into the climate control system. 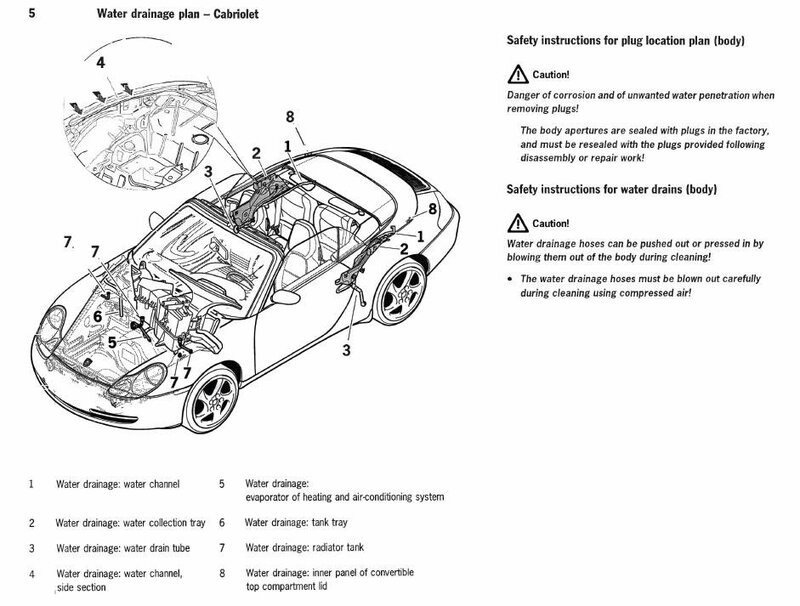 Your leak is most likely the result of the drains in aether side of the car becoming clogged. You can access them easily by looking for the holes as a friend operates the top. Thanks to everyone for the quick and thorough response! I really appreciate your help. You need to check all of the drains. Run some weed whacker string down the drains to make sure they are clear.